. : That Was The Show That Was: The Inter-Galactic Sun Ra Astro-Infinity Myth Equation Commemorative Arkestra | Berklee Performance Center | 20 Feb.
That Was The Show That Was: The Inter-Galactic Sun Ra Astro-Infinity Myth Equation Commemorative Arkestra | Berklee Performance Center | 20 Feb.
[PHOTO CREDIT: Jeff Breeze] I've spent too much of this winter fretting over how I'm supposed to pay for the oil to keep my apartment warm. Last year, I was on my own most of the time and was able to ride on the power of a space heater by keeping myself confined, but this year there are two more people who are actually present. The best times have come when I go to my parents' house and am able to combat the vortex with a more simple solution: the wood stove. If you know how to build a fire and keep it stoked, things warm up better than any other means. But the thing is that you can't just throw all of the wood in there and light a match. First you need to start with some newspaper, and then set up a network of kindling for it to ignite, and then maybe a branch or more porous log that will get that fire to really catch. Only after all of that is done can you start putting the real logs in and getting warmth to emanate. Someone at Berklee seems to understand the principle of the wood stove. When they invited the public to help celebrate the 100th anniversary of Herman Blount's arrival on planet Earth, they were comfortable with letting things simmer for a spell. And so Blount, who died in 1993 and is more commonly know by the name he gave himself, Sun Ra, was feted last week by a gaggle of Berklee professors operating under the moniker The Inter-Galactic Sun Ra Astro-Infinity Myth Equation Commemorative Arkestra during a show auspiciously titled the Sun Ra Cosmic Centenary. Bedecked in audacious costumes that approximated the look of astronaut pharaohs at a rave, the band spent much of the set focusing on the earliest music from Sun Ra's career. While many are quick to dismiss Sun Ra as being mere free jazz, this Berklee-based Arkestra worked hard to honor the notes on the score. When they reached the tune "Future" at the midpoint of their set, it was striking not for the freedom of the sound, but how much the tune just sounded like a fun riff on Dizzy Gillespie's "Salt Peanuts." It was these be-bop and big band elements of Sun Ra's compositions that came to the fore, with only occasional interludes filled with wild African percussion that made nods toward later music that Sun Ra had influenced like Pharoah Sanders' more open explorations on "Thembi." After the faculty played a solid, devotional set of Sun Ra material, it finally got around to tossing the real logs on the fire, bringing out three saxophonists who had each spent decades working with the real Arkestra. 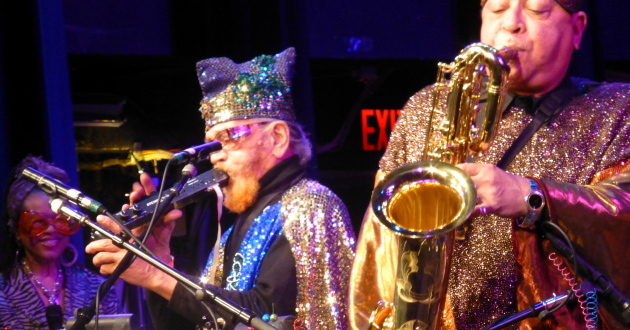 Charles Davis, Danny Ray Thompson, and the 89-year-old Marshall Allen took the stage in sparkling rhinestone capes, and their playing threatened to torch the Berklee Performance Center to the ground. With the band providing a sturdy harmonic foundation, the front row of the assembled throng of musicians became a phalanx of saxes allowing from which each member of the trio stepped up and ventured into wild solos. The most unlikely wrench in the works came as Massachusetts Governor Deval Patrick and his sister joined the band on stage between tracks. Their father, Pat Patrick, had been the original saxophone player when Sun Ra first set out on his own in Chicago in the 1950s, and on this night Thompson bestowed the title of honorary Arkestra member for life on the two of them. Rhonda Patrick-Sigh joked that while getting to witness this was quite spectacular, it was a far smaller band than the one that Sun Ra played with when she had toured with the Arkestra in 1978. The Berklee band then broke into an unprogrammed performance of a song that Davis had co-written with Patrick.